As we close out another year, we’re also closing out our annual Month of Giving! Each year’s Month of Giving is special and this year was no exception. 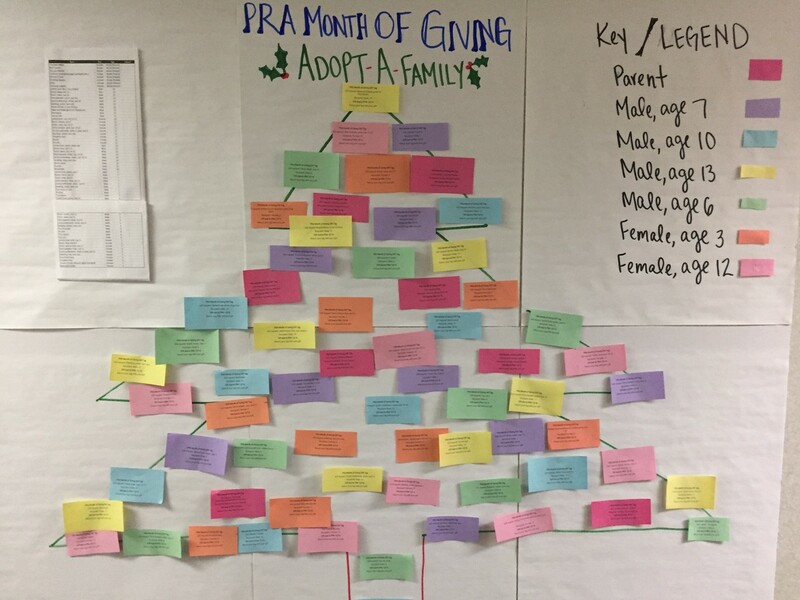 For our 2016 Month of Giving, PRA adopted a family for the holidays. We paired up with the Albany County Department for Children, Youth, and Families to adopt a family of eight—two parents and six children, ranging in age from 13 to 3. The Albany County Department for Children, Youth, and Families serves the families and children of Albany County through four principal program areas: children’s services, children with special needs, children’s mental health, and the youth bureau. We had roughly 65 gift requests from our family; so we sorted them out into color-coded tags to decorate PRA’s Month of Giving tree. Remote and local staff were invited to take as many tags as they liked—requests varied from winter boots to basketballs. Our staff must have been excited about this Month of Giving, because within the first 48 hours of the Month of Giving Tree being posted, all of the gift tags had been picked! In addition to our Adopt-a-Family program, we also signed up to provide prepared meals to a family that we’ve been paired with through the Fostering Futures program. This family of seven is busy as can be, and we were more than happy to provide healthy, delicious meals to make their evenings a bit easier. On December 13, PRA staff members from near and far (Georgia, North Carolina, Nebraska, and Connecticut!) gathered at a coworker’s house in Troy to have a wrapping and cooking party! 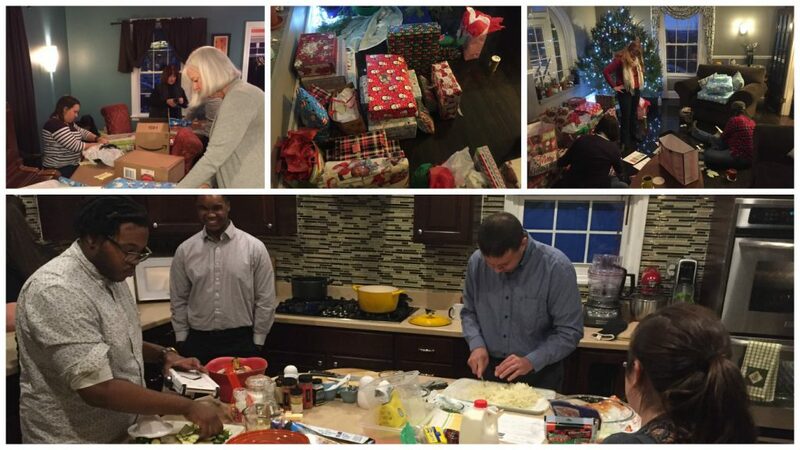 Staff sorted, wrapped, and tagged gifts and cooked up a bevy of delicious, gluten-free meals for our Fostering Futures family. They made macaroni and cheese, baked potato casserole, chicken chili, zucchini lasagna rolls, and peanut butter cookies! Wrapping our presents and cooking meals for our family! Community involvement is a big part of PRA’s culture. Through our monthly breakfasts at the Interfaith Partnership for the Homeless, our annual month of giving program, the matching gift benefit for staff, the volunteering and donation drive notifications that staff post on the PRA Intranet, or the myriad other opportunities that pop up throughout the year, there is always an opportunity for staff to get involved—and they do, which makes PRA such a special place to be. Wishing you good holiday cheer and season’s greetings! 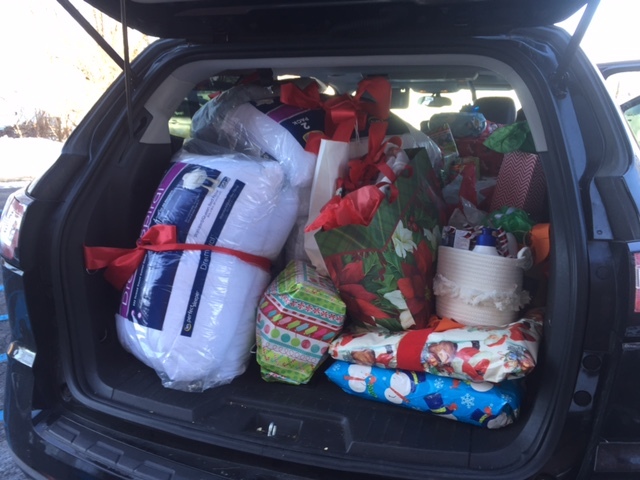 Ashley’s car is packed with gifts for our adopt-a-family!